Jason Morgan is editor of Fleet Equipment Magazine. 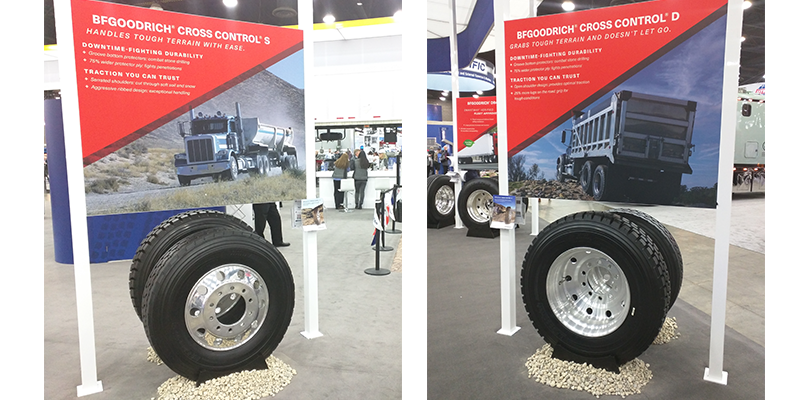 BFGoodrich launched two new all-terrain tires—the Cross Control S and Cross Control D— at the Mid-Atlantic Trucking Show in Louisville, Kentucky on Thursday. The tires are aimed at tackling energy, oil and gas, construction and logging applications. • anti-cut and chip resistance to help prevent damage that can take a tire prematurely out of service. The BFGoodrich Cross Control S (all-terrain steer/all-position) tire provides 20% more mileage on the wide-base iteration of the BFGoodrich Cross Control S than with the BFGoodrich ST565TM wide-base tire, according to the company. The serrated shoulder with staggered rib blocks assist with maneuverability in soft soils and snow conditions. The aggressive ribbed tread design provides traction in challenging conditions without sacrificing handling or ride comfort. The new BFGoodrich Cross Control D, an all-terrain drive tire, offers many of the same features as its steer counterpart. Built for traction, it is designed with 25% more lugs on the road to grip snow, mud and dirt, the company stated. A 75% wider protector ply3 than a leading competitor provides greater protection from road hazards and penetrations, which can leave fleets and owner-operators on the side of the road encountering unexpected downtime. The BFGoodrich Cross Control S tire is available in sizes 11R22.5 and 11R24.5 (Load Range H), 315/80R22.5 (Load Range L), and starting in May 2018 will be available in sizes 385/65R22.5 (Load Range J) and 425/65R22.5 (Load Range L). The BFGoodrich Cross Control D tire is available in 11R22.5 and 11R24.5 sizes (Load Range H). And confident in the Cross Control’s downtime-fighting durability and increased mileage, BFGoodrich offers a work-hard guarantee for the products.